Submersible to 20m; Recoil tested to .50 cal. Step up to the professionals' choice for advanced thermal imaging in a clip-on system with the Armasight® Apollo Pro LR 640 100mm (30 Hz) Thermal Imaging Clip-on System. The Apollo Pro is effective day or night, in any atmospheric conditions, providing accurate, effective targeting through rain, snow, fog, haze, smoke and other obscurants. 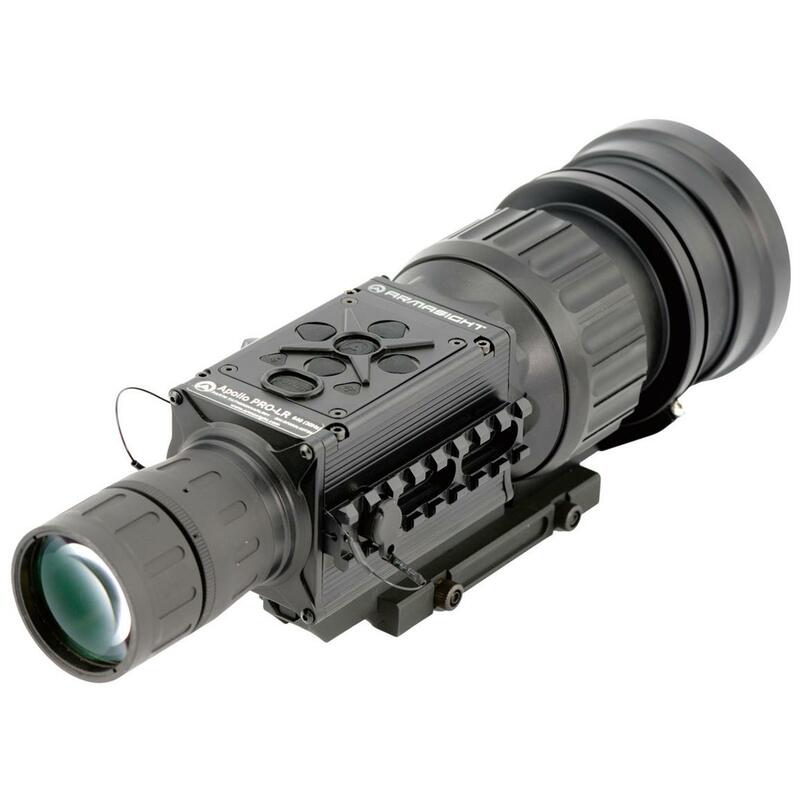 Built to MIL-STD-810 specs, Apollo Pro thermal optics are designed to perform in the harshest conditions. Each is recoil tested to .50 cal., totally waterproof and can be submerged up to 20m. Advanced features of the Pro series include a digital compass and digital inclinometer. Plus, an upgraded 4-battery power system that delivers up to 7 hours of continuous use and remains mission-capable with just a single battery. 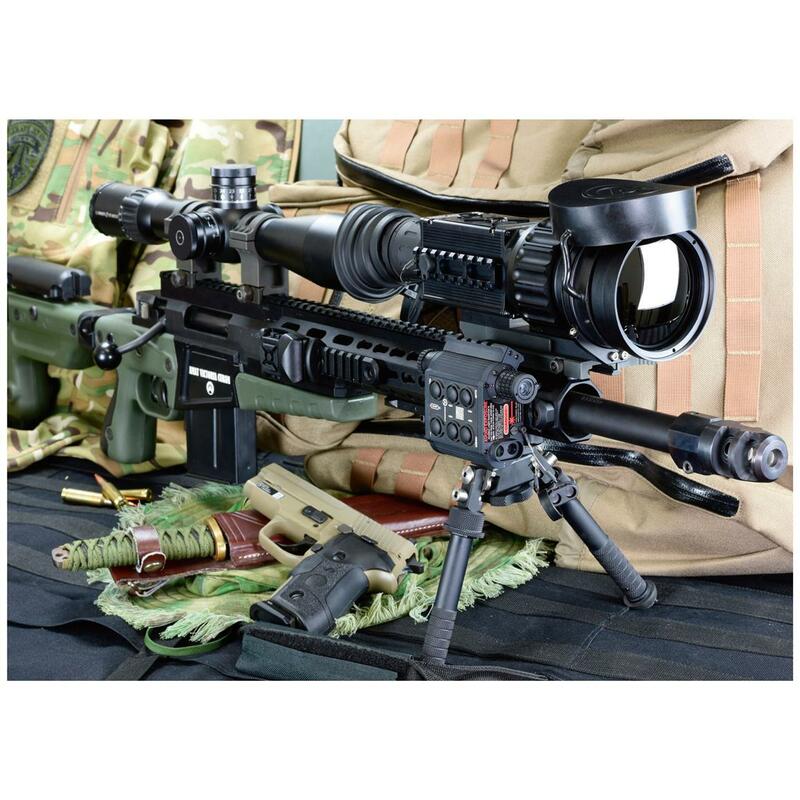 This system mounts directly in front of your variable magnification sniper day sight, eliminating the need to remove your day sight from your weapon. Installation is easy, repeatable, and reliable based on a user-friendly MIL-STD- 1913 / Weaver / Picatinny rail-compatible, quick-release locking mechanism. Video-in capability and still photo / video recording and playback are possible with with the optional Armasight® DVR (sold separately). And, Bluetooth® wireless capability allows for sharing of data and easy downloading of software updates. Simple, intuitive controls, direct button adjustments, direct combination button functions and electronic menu selections make the Apollo Pro easy to operate and adjust for optimal performance. The included wireless remote control can be placed anywhere on your weapon, allowing for easy adjustments and control manipulation without taking your hands off your weapon and out of the shooting position. Rapid start-up gets the Apollo Pro up and running in less than 3 seconds, and a full compliment of color modes and special, user-adjustable imaging tools allows for fine tuning images to the situation and operator preference. 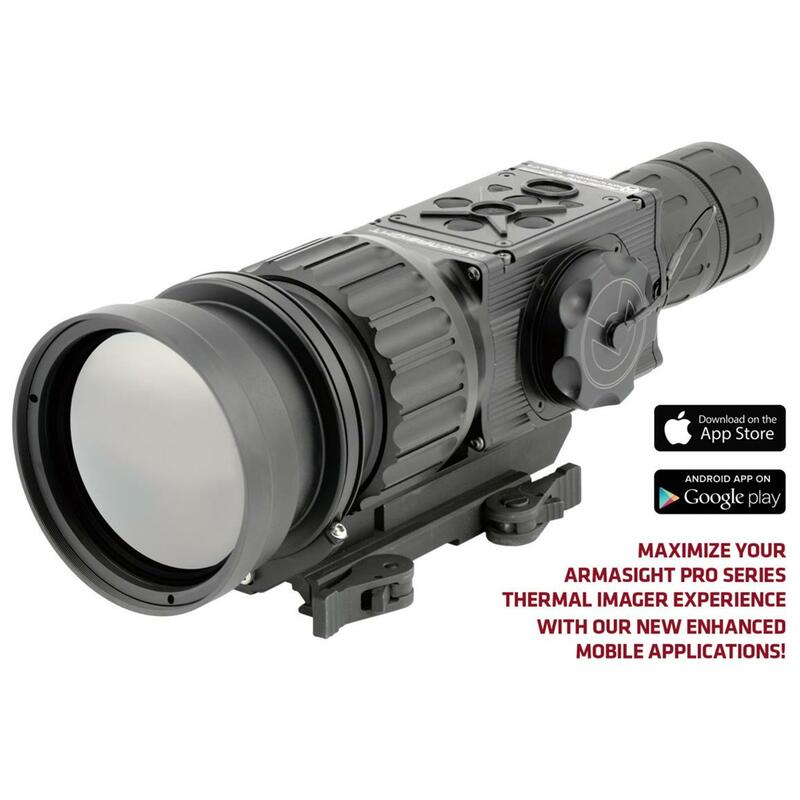 Special User-Adjustable Imaging Tools provide ultimate versatility and customization. Active Contrast Enhancement (ACE) - a digital "Contrast" correction that allows for a smart scene optimization based on dynamic adjustments where a variety of contrast levels occur depending on relative scene temperature. Second Generation Digital Detail Enhancement (DDE) - a "Sharpness" correction that digitally enhances the picture to present clearer imagery, significantly improves edge sharpening and further reduces image noise. Smart Scene Optimization (SSO) - a fine-tuning computational correction that significantly improves an overall visual acuity for targets that have thermal signatures similar to a surrounding background. Automatic Gain Control (AGC) - a "Gain" correction used to automatically adjust the gain to an appropriate range, the weaker the image signal, the stronger the gain. User-Controlled Manual Non-Uniformity Correction / Flat-Field Correction (UCMNUC / FFC). There is a mechanical shutter between the camera sensor and the lens. This shutter is used to perform a non-uniformity correction (NUC) also known as flat-field correction (FFC. During FFC, the shutter presents a uniform temperature source to each detector element in the array. While imaging the flat-field source, the camera updates the offset correction coefficients, resulting in a more uniform image after the process is complete. All Apollo Pro models allow for user to manually trigger or interrupt scheduled UCMNUC / FFC function. Silent Shutterless NUCTM (SSN) - In addition to user controlled manual NUC / FFC all Apollo Pro models employ a digital supplemental non-mechanical flat-field correction that allows to extend the periods between mechanical shutter events and to further reduce image noise. SSN is an always ON enhancement. Reticle Type: 6-Pattern Digitally Controlled: Dot 4 MOA, Line Dot, Cross Center Dot, Cross, Crosshair, and 'No Reticle"
Active Contrast Enhancement (ACE) - "CONTRAST"
Second Generation Digital Detail Enhancement (DDE) TM "SHARPNESS"
Smart Scene Optimization (SSO) TM "SMART SCENE"
Information Based Histogram Equalization (IBHEQ) TM "SKY / SEA"
Battery Life at 68°F: Up to 7 hrs. Overall Dimensions: 11.3" x 3.5" x 3.9"